There is a good possibility that I am bored. I’m tired of shuffling through the same piles of fluff, browsing through the same uninspiring books, spinning the same basic yarns. This feeling of apathy is making it much easier to sell unwanted materials and supplies. 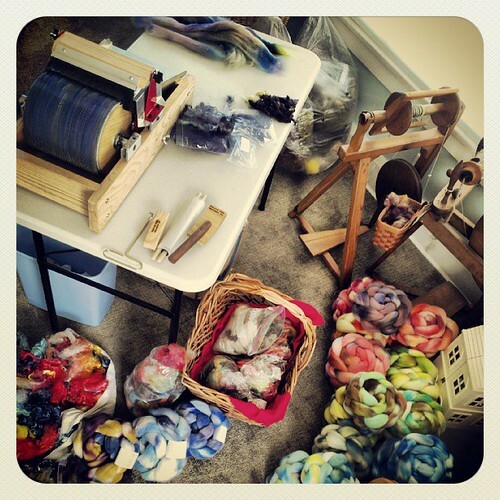 FYI, there are still a few grab bags in the shop in case you need some felting or carding fiber. The next purge has taken place in my library. I’m sure many of us buy knitting/spinning/fiber books because they are on sale or seem interesting at the time. A few years later you realize you’ve never made any patterns from that book or it just doesn’t fit in with your lifestyle. I have a book on shawls — huge shawls. What do I make? Mittens, hats, a very occasional sweater. Never a king bed sized shawl. Out with you! Getting rid of things is exciting. But getting new things is also exciting. I thought it was time to revisit crochet. It’s been 15 years since I learned how to do it, but I haven’t moved much beyond a single chain. I’m 27 now, not 12. I can do a granny square, gosh darnit (I hope). The first book has several lovely, modern patterns that make crochet look nice, not farty. And the second is, as mentioned in the title, an encyclopedia, so it should help expand my general knowledge of stitch possibilities. We shall see. The Zimmermann book was purchased because I did not have any of her books already, and I felt that I was supposed to have at least one. The last book is full of different types of yarn. I have a few other art yarn books, but this one is far more extensive. From what I’ve seen flipping through it, it looks fairly promising. Now the key is to utilize these books and try something new, not leave them on the shelf for destashing in another five years.